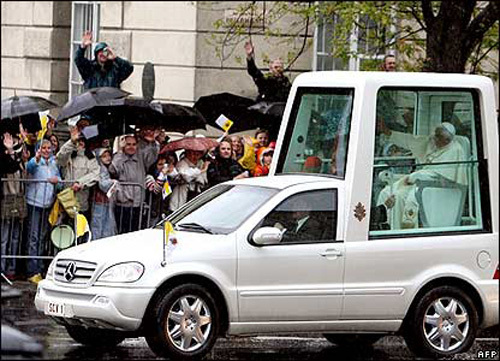 The Vatican says Pope Benedict XVI would gladly use an EV Popemobile as another sign of his efforts to promote sustainable energy and take care of the planet, but one has yet to be offered. His comments came during a presentation of a book on the Vatican's ecological efforts: "The Energy of the Sun in the Vatican." The book documents the 2008 installation of photovoltaic cells on the roof of the Vatican's main auditorium and the 2009 installation of a solar cooling unit for its main cafeteria. SolarWorld marketing chief Milan Nitzschke said the main hurdle is to get the Vatican security apparatus to sign off on it, since some still have concerns - unfounded, he said - that electric cars don't accelerate as quickly as traditional ones. "It's really no problem," he said, noting that electric cars can go from 0-100 kph in three seconds. "This is something we have to discuss with the people who are in charge of the security aspect, but of course this is possible and it would be a very, very huge symbol." 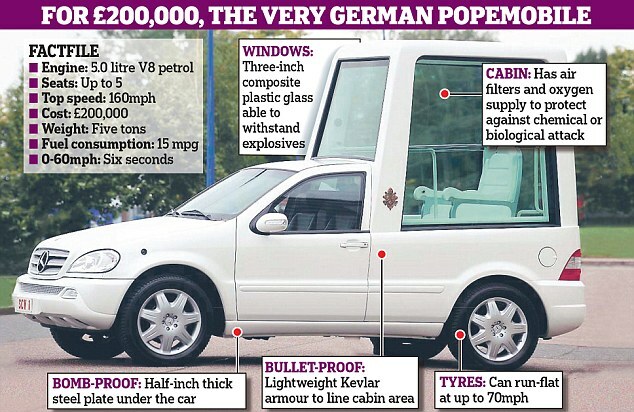 Lajolo added: "If he's offered a functioning, efficient and appropriately sized popemobile, why not?" "It would also be a demonstration, a sign of his ecological attention. 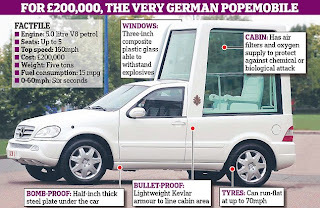 And we hope SolarWorld can furnish it," Lajolo said, though he added that the Vatican would be open to any other carmaker donating one as well. When he's outside the Vatican, Benedict usually rides in a modified white Mercedes-Benz outfitted with bullet-proof windows; it has room for two passengers in addition to the pope, who sits on an elevated chair to wave to crowds. Benedict has spoken out frequently, including in his encyclicals and books, about the need to safeguard Earth's natural resources. "If you want to cultivate peace, protect creation," he exhorted in his 2010 message for the church's World Day of Peace.